Obverse: Ship, right, bearing cross with Tudor rose below, initials H K (Henry and Katherine of Aragon) either side of mast. Text around HENRIC DI G R AGL Z FRANC DNS HIBERN. Reverse: St. George in armour on horseback right, with lance in right hand, slaying the dragon. Dragon with head to right being trampled and with spear in mouth. Text around TALI DICA SIGNO MES FLVCTVARI NEQVIT (Consecrated by such a sign the mind cannot waver). History: The Henry VIII George-Noble is one of the rarest and most distinctive English coins. 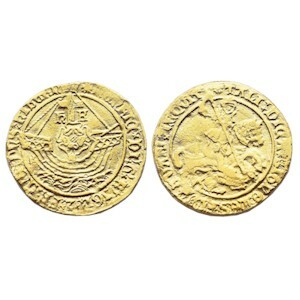 In 1526, in an effort to prevent the drain of gold to continental Europe, the value of English gold was increased. After the Angel had been revalued at 7s and 6d (90 pence), the George-Noble was introduced as its replacement with a value of 6s and 8d (80 pence). The George-Noble was soon discontinued, and was certainly not used after 1544.